Illustrated by Coco Dowley. 34 p., Simon and Schuster, 2000. The author draws the reader's awareness to the wonder of everyday things, such as bread, cats, apples, roses, and pie. She comments that "the wonderful" happens over and over again - including in the existence of the child reader. This book will help to promote children's self-acceptance through a sense of having a place in the world of nature. Illustrated by Pat Cummings. 32 pages. Harper and Row, 1988. During a storm that interrupts electric service, Thomas, about six or seven years old, notices sounds and smells in a way that he hadn't before. Although he says he isn't afraid, his grandfather tells him a story of being fearful during a storm at Thomas's age. As the story goes on, Thomas is able to acknowledge his fear a little, and the storm subsides. Children may be more able to acknowledge their own fears after reading this story. Illus by Ana Juan. 40 pages. Random House, 2007. Sometimes the capacity for friendship and caring can be found in unlikely places. Bibi, a wealthy woman who loves fine things, doesn't have any friends. One of her possessions is a bejeweled music box that has two beautiful, but very sad-looking, ballerinas inside. When Bibi eventually acknowledges the ballerinas' sadness, she tries to cheer them up. She kisses them, and although she isn't sure this changes their expressions, she notices that it feels good to her to love them. Trying to make the ballerinas happy, Bibi takes them a on a trip around the world. But she loses the ballerinas. As she searches desperately for them, she says she'd give up all her possessions to have them. At this moment, they grow into real girls as they're reunited with Bibi. She realizes that she has friends - and that friends are all she really needs. Bibi has shown children that friendship is more valuable than ownership of things, and more subtly, that being a friend means treating the other like a person, not an object. The Edible Pyramid restaurant opens, and the maitre'd explains the U.S. Department of Agriculture's Food Guide Pyramid, which recommends food choices for good nutrition. Many examples of each level of the pyramid are shown, and the book includes a helpful discussion of the meaning of serving sizes. This book offers clear, useful information on healthy nutrition, with a positive outlook on fruits and vegetables and the realistic advice to allow small amounts of sweets and fats. Illustrated by Mary McQuillan. 26 pages. Millbrook Press, 2000. On each page, an animal has an odd, and in some sense amusing, injury; for example, a centipede has sprained all but two of her 100 ankles playing field hockey. All the animals do what their doctors recommend, and all recover. Some children who would be sensitive to the animals' plight might find it more upsetting than funny. However, this story will remind many children that it could be worse, and will promote their wellness through humor. Illustrated by Mary Whyte. 26 pages. Chronicle Books, 1996. This story addresses the concerns a child may have about being loved enough when there is more than one child in the family. Two brothers, Max and Julian, go fishing with their Mama. They ask Mama whose can has more worms, who is the best rower and the best fisherman - and finally, at bedtime, which brother she loves most. She responds to each question by expressing her experience of the uniqueness of each child. She loves Julian the bluest and Max the reddest. At the end, the author describes them as "the boys she loved best." This story conveys the idea that a new sibling can't displace an older child, because the older child is loved for him- or her- unique self. Sometimes it takes just a tiny step -or a tiny dot- to begin to have self-confidence. As this story begins, Vashti is absolutely convinced that she can't draw. With her teacher's gentle encouragement to "just make a mark and see where it takes you," she resentfully makes a dot. Remarkably, when she allows this, the dot takes her farther than she'd ever imagined. She paints dots in different colors and sizes. She shows her paintings at the school art show. There, she is recognized as an artist, and shares what she's learned with another child. With Vashti, children can learn how to allow their potentials to unfold, and may even allow themselves to acknowledge their capabilities. Illustrated by Fabricio VandenBroeck. 32 p., Charlesbridge, 2001. Carlos's Tío Tomás nearly always seems to be grumpy. He is a monolingual Spanish speaker and resents the use of English all around him. Carlos enjoys Tío Tomás's brief better moods, when he tells Carlos stories from Mexico about Aztec gods. When Tío Tomás is the only adult available to attend Carlos' parent-teacher conference, his teacher asks third-grader Carlos to serve as interpreter. That night, Carlos asks for an Aztec story, and Tío Tomás expresses the belief that Carlos only likes English, and explains that he is ashamed of his fear of speaking English. Carlos empathizes, telling Tío Tomás that he has been teased about the limitations of his own English. Tío Tomás is impressed by Carlos's courage, and finds within himself the ability to allow Carlos to help him learn. Eventually, Tío Tomás proposes that Carlos keep teaching him English and he keep telling Carlos stories from Mexico, in Spanish. Carlos is delighted, because this will double the knowledge of both. This story will help children understand that culture doesn't have to be an "either-or" attribute - it can be "both/and," to the person's benefit. The John J. Harvey is a fireboat that was built in 1931 and fought many fires. By 1995, it was to be sold for scrap; five years later, a group of friends decided to buy it just for fun. They had it restored, but people still said it could never help fight a fire. When the World Trade Center was attacked on September 11, 2001, and fires broke out, the owners of the Harvey volunteered to use it to help. It was used to fight fires when other methods could not work. "The Harvey was a hero." A limitation is the use of the pronoun "she" to refer to the boat. But children might identify with the Harvey because of its apparent inability to manage disasters; if so, they may feel that they, too, can be heroes. Illustrated by Elsa Warnick. 32 pages. Abrams, 2006. Separation can be more tolerable when children use their imagination to remind them of their connection with the person they miss. In Hugs on the Wind, Little Cottontail misses his grandfather, who is far away. When he imagines Grandfather missing him, too, it occurs to him that he can send love to Grandfather in many ways. He can send hugs to Grandfather on the wind, smiles through the clouds, and his funniest joke through the babbling river. This not only brings him joy, but also allows him to imagine Grandfather singing to him in the song of the rustling trees, and winking at him in the winking stars. With the loving support of his Mama Cottontail, he clearly experiences Grandfather as being close in his heart. Gentle watercolor illustrations expressively convey both the bunny's earnest littleness and his secure, relaxed sense of comfort in nature. With Little Cottontail, children can find creative ways to stay connected to someone who is far away. Illustrated by Kathy Parkinson. 34 pages. Health Press, 1998. Ben and Marcus's Mom goes to the hospital for an operation. They make a paper chain with two links for each day that she will be away, so that they can each pull a link off every day. Because their hugs hurt Mom's incision, Dad invents a "yarn hug" by wrapping a piece of yarn around Mom and the children. Eventually Mom discloses that she has cancer, assuring Ben that he can't catch it. She is honest about not knowing when she will get better. Mom takes the children to meet her oncologist, and to see the room where she will have chemotherapy and the radiation facility. Although the children miss Mom during her treatments and when she is home but debilitated, they find ways to have fun with their babysitter and Dad. Ben and Marcus express and work through their worries through play with bears and through caring for an injured bird. At the end of the story, Mom's cancer is in remission. An introduction for adults and a brief glossary are included. This story offers children empathy with the experience of having a parent who has cancer, models for positive coping and sticking together as a family, and hope for getting through this difficult time. Sarah tells the story of her relationship with her Grandpa Abe from the time of her birth (when he was Grandma's boyfriend) until his death when she is nine years old. In doing this, she is sharing her memories of him, which she has securely within herself. She is depicted as experiencing mostly disbelief in response to his death; her Grandma's sadness is also shown. With Grandma's permission, Sarah keeps one of Abe's sweaters, and she is able to help Grandma smile by doing a magic trick Abe taught her. This story shows how remembering someone can help the mourning process and can keep with us someone who has died. Illustrated by Ed Young. 32 pages. Gulliver/Harcourt Brace, 1987. Sometimes a lack of appreciation for oneself leads to a wish to be someone else. In I Wish I Were a Butterfly, the littlest cricket in the pond wishes he were a butterfly, because a frog told him that he's ugly. He's so sad that he doesn't want to make music like the other crickets. Other insects tell him the kinds of unhelpful things that people often say to one another; for example, that it's no use to wish to be different, and that he shouldn't pay attention to the frog. He finally learns from the Old One, a spider, that there are more ways to see himself, and that he can take on the compassionate point of view of a friend, not the less-thoughtful point of view of a stranger. This story shows children how to choose a kind, caring perspective from which to see themselves. Illustrated by Carol Thompson. 26 pages. Candlewick, 2000. As this story begins, William is moving into his new house, and he doesn't like it. He misses his old house, and the view from his old room of the garden he and Dad had there. What is unsaid, and not even hinted at until the very last lines of the book, is that he has moved because his parents have divorced. His mom helps him decorate his new room, and he allows himself to choose new wallpaper instead trying to replicate what he had at his old house. At the same time, he's also allowing himself to make a new friend. Having taken these steps into his new life, he finds himself happy and comfortable. Children will understand that although the changes of divorce are difficult in many ways, positive changes are possible too. Mr. Sillypants (who wears baggy, bright blue pants with a green and red plaid pattern) has just registered for a swimming class, and finds himself with lots of worries. He makes himself a silly sandwich, worries some more, and goes to bed. He dreams of falling into the water. In his dream, at first, he panics, but then he turns into a fish. Creatures that look a little like the pickles in undersea sandwiches, with olives for eyes, attack him. He's saved by the bell - of his alarm clock - and wakes up confident that everything will be all right in his swim class. In fact, it is fine, even though he's the only adult. This story shows a way to use imagination to be amused by your fears about swimming lessons, which seem quite manageable and ordinary after all the weirdness of Mr. Sillypants' dream. PJ has a new potty and a new puppy. PJ and the puppy learn together: PJ to use the potty, and the puppy to use newspapers. They both have accidents while playing, but then wake up dry from naps, and use their respective toilet facilities, inspiring pride in PJ's mother. This amusing book is has very little, and very simple, text. Children can learn along with PJ and the puppy. Illustrated by Sophie Blackall. 29 pages. Chronicle, 2002. This is the true story of the author's grandmother, who was the granddaughter of a man who left China to join the California gold rush and returned to China wealthy. It was unusual at that time and place for girls to be allowed to go to school, but in this family, it was permitted. At the same time, though, while boys had no other responsibilities than school, girls were given household chores. While boys went to university, girls married and were sent to their husbands' families' homes. Ruby is a determined child who insists on wearing red every day, and is the only girl to persist in school, often staying up later than anyone else to fulfill all her responsibilities. She wants to go to university. Ruby is aware that girls are treated unfairly, and expresses this in a poem that comes to the attention of her grandfather. Just when she despairs, he gives her a special gift: a letter of admission to the university. This story offers encouragement to persist in following your dreams in spite of prejudice. Ella and her Grandpa love walking together in the pine barrens near their house. Grandpa has taught her what is special about dwarf pitch pine cones: the seeds inside can only be released to grow if there's a fire, and there will only be room for them to grow if a fire burns down the old trees. As time goes on, Grandpa is less and less able to walk, and even too tired to be carried to the woods by the family - Ella's parents, her pregnant older sister, and sister's partner, Sam. There's a lightning storm, and the woods catch fire. When Ella helps the firefighters, along with Papa and Sam, she finds a pitch pine cone that's opened by the fire, and brings it back to Grandpa. Grandpa soon dies, and Ella plants a seed from the pinecone beside his grave. Months later, a baby pitch pine grows, and Ella's new nephew grows too. Ella plans to teach him all that Grandpa taught her. 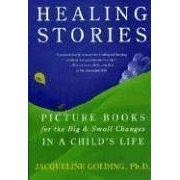 This story offers children a healing image of the continuity of life. 26 pages. Little, Brown, 2000. Blossom (a rabbit) and Boo (a bear) are best friends. They're kind to each other and have fun together. When it's almost time for Boo to hibernate, they tell each other they'll still be best friends even when they can't see each other every day. When Boo doesn't come out one day, Blossom realizes he's hibernating, and she's lonely playing by herself. But she remembers Boo, the good times she had with him, and the ways he taught her to comfort herself, and all that helps. In the spring, they reunite joyfully. Children will understand that friends have fun together and are kind to each other, that friendship can survive separation, and that good memories can help friends cope with being apart. Kids may have difficulty accepting themselves because it seems as if it would be better, somehow, to be someone else. In this rhyming story, a cat wishes it were a dog because of all the exciting things dogs get to do. Then its human points out that if it were a dog, the cat would have to do things it doesn't want to do, and wouldn't be able to do the things that only cats can do. The human urges the cat to stay a cat. As the story ends, the dog, having heard all the great things the person has said about being a cat, starts to wish that it was a cat. This story shows children how to see what's positive about being who they are. 10 pages. Random House, 1989. There's bound to be trouble when a North-Going Zax meets a South-Going Zax. Each one thinks the other is in his way, and each refuses to move aside, because that would mean going east or west, and neither is willing to do that. They yell at each other righteously, but neither one will move, so neither can go anywhere. Highways and cities are built, and the highway has to include an overpass over the Zax, who haven't budged an inch. This story shows children quite clearly, and with humor, how silly people look when they're stubborn. Illustrated by Marylin Hafner. 32 pages. Putnam, 1978. It can be frustrating to wait for a loose tooth to come out. Elizabeth Ann has one that just won't come out, not matter what she does. Even when she tries to forget about it, she can't help thinking about it. Finally, during a baseball game with friends, she is able to forget about it - and it comes out. Children will feel reassured that even a stubborn loose tooth will come out eventually. Illustrated by Kathy Parkinson. 24 pages. Whitman, 2003. A little guinea pig says that she feels good about herself. She feels loved, and she knows that it's OK to be just the way she is. Realizing that some things will be easy for her to do and others will be more difficult, as they are for all of us, she understands that her unique contributions are valuable. The little guinea pig likes to learn, and can try again if she makes a mistake. A foreword for parents and teachers is included. This book gives young children a strong positive message about self-acceptance. Illustrated by Aminah Brenda Lynn Robinson. 32 pages. Whitman, 1998. In this story, which is illustrated with vibrant multimedia images, a father poetically tells his son and daughter about the history of the African American people, including slavery, the civil rights movement, and accomplishments in the arts, sciences, and business. This story inspires pride in African American heritage. Illustrated by Jerome Lagarrigue. 32 pages. Atheneum, 2001. Joe, who is European American, tells about his best friend, John Henry, who is African American, in this story of the South under Jim Crow laws. The two boys love to swim, and to eat ice pops in the summer - but John Henry isn't allowed in the town poor or through the front door of the general store. When the Civil Rights Act of 1964 is passed, the boys are excited because they can swim together at the town pool. When they get there, on the very first day, a crew is filling the pool with asphalt. John Henry understands that this is about racism, and is enraged and hurt. Joe suddenly becomes aware of all the things he can't do with his best friend. As the story ends, the two boys bravely walk together through the front door of the general store to buy an ice pop. A foreword briefly explains the Civil Rights Act and summarizes the author's experience of growing up in the 1960s as a European American child in the South. This story offers children an understanding of how racism hurts both oppressor and oppressed, and a glimpse of the courage that's needed to work against it. Mark uses a dream of a fishing trip to help himself through a fever and to learn something about himself. His uncle sends him a box of fishing lures, which reminds him of a fishing trip they took together, and this inspires a dream that feels very real. In the dream, Mark imagines fishing with his uncle, very skillfully, and discovers that he wants to let fish go rather than kill them. After this dream, his fever breaks. This story offers children an example of how to use imagination to cope with being sick. Illustrated by Jenny Jones. 32 pages. Bloomsbury, 2003. After Harry has helped his mother shop, the grocery box becomes all kinds of things in Harry's imagination: a shop, a lion's den, a pirate ship, an undersea cave, and a castle. Harry and his dog inhabit these imaginary worlds as a shopkeeper and a customer, an octopus and a dog-fish, and other characters. When Harry's mother, the king's foe, arrives at the castle, he decides to be friends with her, and puts the box behind the couch. There it becomes a cozy bed where Harry and his dog can dream of past and future imaginary worlds. This story shows children how to imbue an ordinary object with imagination. 32 pages. Viking Penguin, 1997. The little pig from Nancy Carlson's book I Like Me and her mouse and frog friends use the letters of the alphabet to celebrate their good feelings about themselves. Each letter is related to a positive attribute; for example, A for awesome, B for brave, and C for cheerful. Children can use the characters' examples to appreciate their own positive qualities.